2-hand synchronization is key to making your guitar playing sound great at any speed. You need specific guitar practice strategies that isolate the core components of 2-hand synchronization and help you master them. Focusing on your guitar technique foundation helps your guitar playing sound better with any exercise. Step 1: Select A Scale To Practice On A Single String And The String To Practice It On. Tip: Your exercises will sound best if the open string is either the 1st or the 5th note in the scale you select. Make sure you can visualize the notes in the scale you are about to play on a single string. 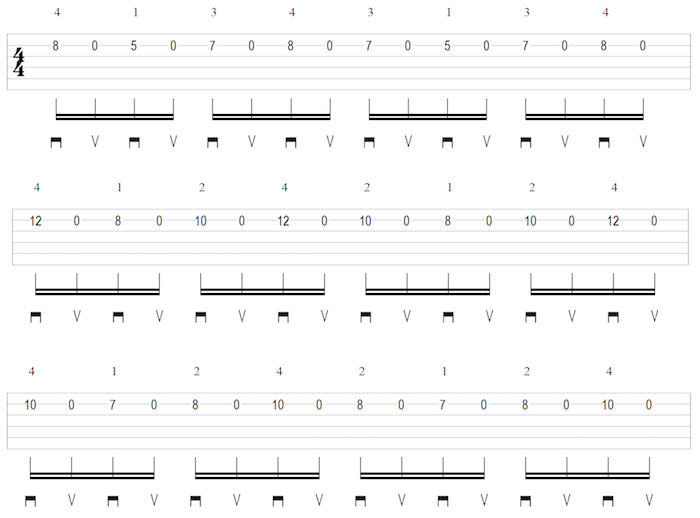 Step 2: Create A Simple Pattern To Practice That Stays In A Single Position Of The Guitar. Make your pattern about 1 measure long, as shown in the example. This makes it much easier to remember and focus on your guitar technique as you practice. Tip 1: Move your fretting hand fingers quickly, no matter how long the notes sustain after they are played. Watch the video to see why this is important. Tip 2: Find the fastest metronome tempo where you can play the exercise with perfect synchronization. Spend most of your time practicing at that speed. These exercises are simple to play at slow to medium speeds, but become exponentially harder to play at 85%+ of your top speed. You want to practice at tempos that are most challenging, while staying in complete control of your technique. You must be able to hear (and be certain) that your hands are in perfect sync for every note. Increase the metronome tempo as you improve (but make sure you can clearly hear and feel your hands lock in sync for every note). Keep track of your maximum speed weekly. As your top speed improves with this exercise, your general top speed improves as well. Tip 3: Watch your picking hand and minimize unnecessary motions from the pick. The pick must move straight up and down for every note. Do NOT let the pick swoop away from the strings in an arc between notes. This makes your picking very inefficient and makes fast playing impossible. Step 3: Extend Your Exercise To Other Shapes Of The Scale, While Staying On A Single String. This is a more advanced variation of the previous step. Step 4: Reverse The Picking. Practice the exercise in step 2 by starting with an upstroke instead of a downstroke. This challenges your 2-hand synchronization much more (and forces it to improve). Reversing the picking feels awkward at first, but becomes much easier after a bit of practice. It also makes your upstrokes just as articulate as your downstrokes (which helps your playing sound more accurate at faster tempos). Step 5: (Advanced Tactic) Change Strings. Change strings periodically (while maintaining the alternating pattern of 1 fretted note and 1 picked note). This makes 2-hand synchronization much harder to control. Pay attention to the first note on each new string and articulate it harder with the pick. This helps to keep your hands in tighter sync from string to string. Note: you need to select a scale that contains many notes that match open strings on your guitar to make these exercises sound good. These exercises make awesome warm up drills or can be used as standalone training tools to improve your 2-hand synchronization. Set aside 10-15 minutes per day 3-5 times per week to practice them. Use a metronome to track progress with your maximum speed. Improving your speed with these single-string drills makes all your guitar technique exercises feel tighter, cleaner and easier to play. This guitar practice video gives you more ways to improve your picking technique and make your guitar playing sound great. Learn how to practice guitar perfectly and become the guitarist you want to be much faster.